I thought I would take a break from my normal topics and begin a hub in another area that has always held great fascination for me ... science. As I have mentioned in my profile and other places, Science aka Natural Philosophy, plays a major role in my overall philosophical beliefs. For example, I think science holds the key to understanding Free Will, but, that is not the purpose of this hub. 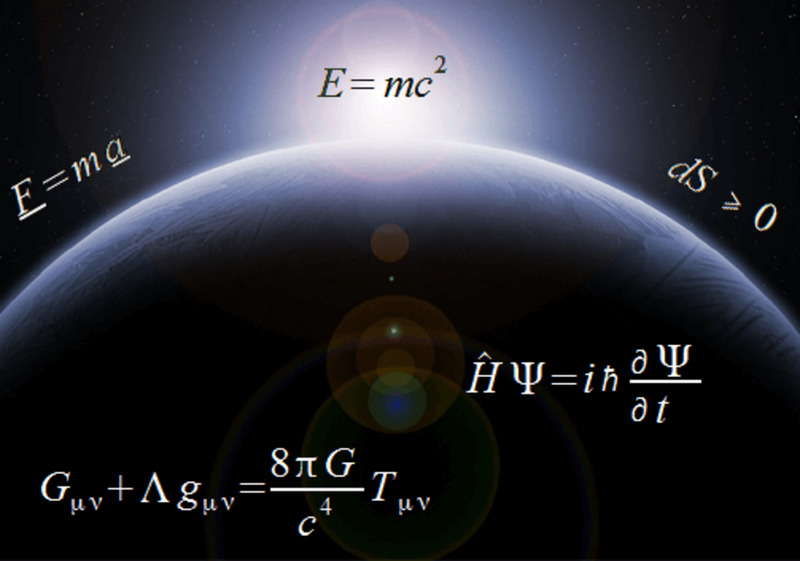 derive, in layman's terms, Albert Einstein's famous equation, E = MC2. Shouldn't be too hard, don't you think? 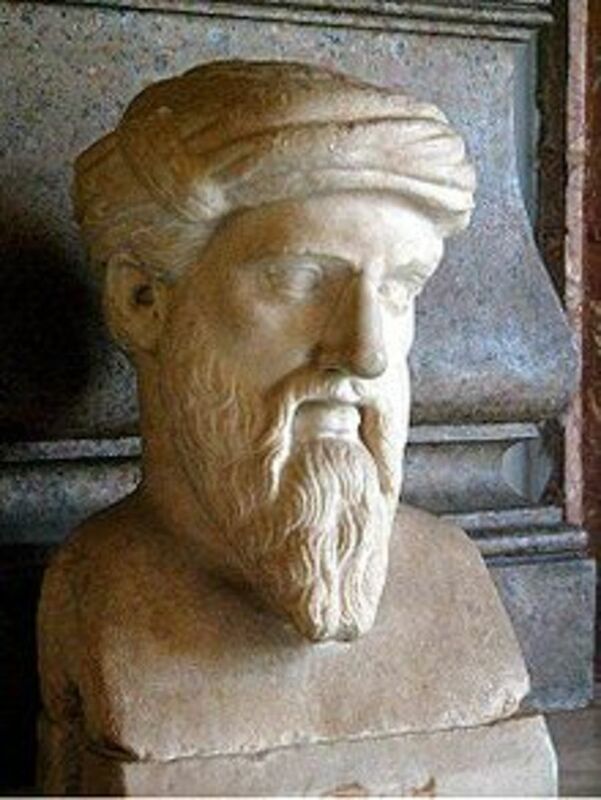 As an aside, it is interesting to note that Pythagoras of Samos (570 BC - 495 BC) is not who actually derived this equation, it was well known by the Babylonians 1,000 years earlier. I suspect my high school instructors tried to teach me why this equation worked but, if they did, it never sunk in. All I ever knew was the formula, when and how to apply it. Well, to understand how we get from C2 = A2 + B2 to E = MC2 we need to actually know why Pythagorean's Theorem really works; so, here goes. If you look at Chart 1, you will see I drew two squares of equal size; in this case all sides are 5. That means, of course, that the Area of each square must be 25. Now, as you can also see that I stacked the two squares on top of each other so that they have one side in common; that side is the base of one square and the top of the other. From this, it is easy to see that the Areas of the two squares are and must be the same. Now, what is a right triangle? It is simply a triangle which has the property that one of its angles is exactly 90 degrees; nothing more, nothing less. 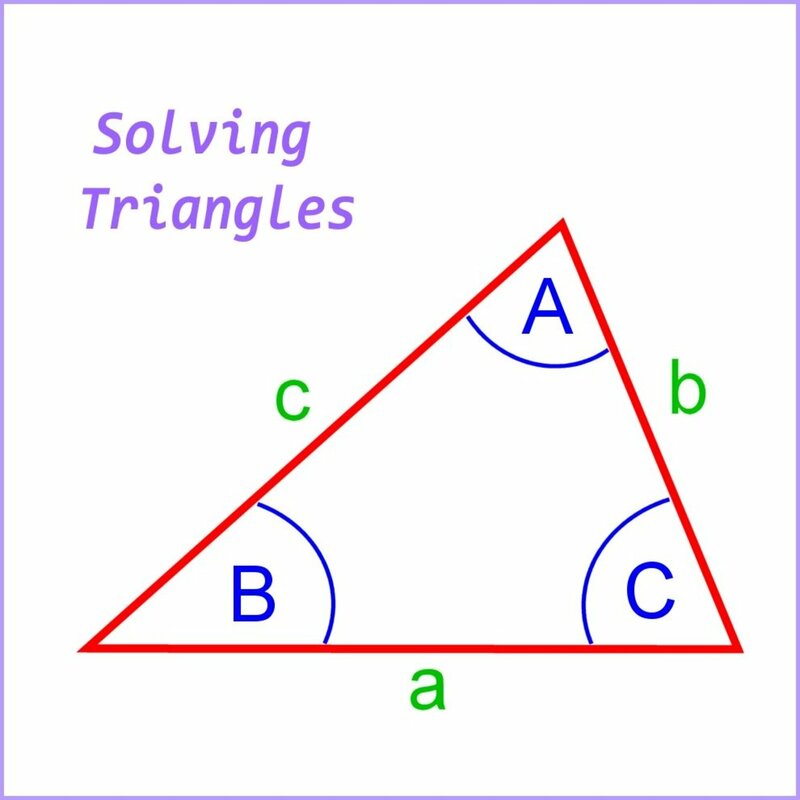 Since a triangle, by definition, is made of three sides and three angles, we can label these sides A, B, and C; and angles < a, < b, < c, respectively. By convention, the hypotenuse, the side opposite the 90-degree angle is labeled C.
In our first example, Chart 1, something is missing, side 'B'; it is shown with length zero. Even though this picture looks like two squares stacked on top of each other, it really is a Right Triangle. How, you ask? Simple, I say. One of the three angles is zero degrees leading to the side opposite (B) being length zero. Since this is really a right triangle, Pythagorean's Theorem applies. Consequently, you should be able to see what the equation is actually saying is that the area of the square attached to the hypotenuse (C) is equal to the sum of the area of the squares attached to the lines opposite the other two angles of the triangle. In this first case, since one of the angles is zero, the side that would be opposite of that angle is non-existent and we are left with the stacked squares. In Chart 2, you see we raised one corner of the Green square a bit while maintaining the length of side 'C' so that the area of the square does not change. Well, when we do this, two things happen: side 'A' of the Red square gets shorter and we create side 'B' of a new square, the Blue square; remember, we are dealing with a right triangle here. What is happening here? We are maintaining equality, that is what. Because we are dealing with a closed system, the Green and Red squares comprise the total system and they must be equal in all dimensions because they are squares and share a common side, the initial equality must be maintained. Just because we change the position of one of the squares, so long as we retain the integrity of the right triangle, we don't invalidate the relationship. So, as we lift the Green square we create a recognizable right triangle, but, in doing so we shrunk the Red square, in our example for 5 units to 4 units. Given side 'A' is now 4, that means the area of the Red square is 16 which is now less than the Green square. This means, of course, that we need to bring the total area of the non-Green squares back up to 25. This is accomplished with the creation of the new leg 'B' and the Blue square. As you can see, the Blue square requires an area of 9 so that with the Red square we still have a total area of 25. No matter how little or how much you raise the Green square, this must be true. 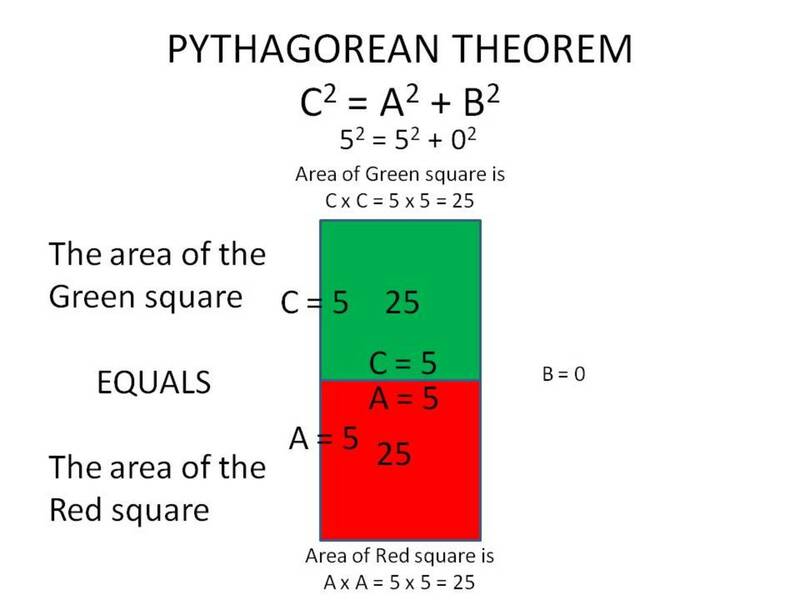 In order to maintain the equality within this closed system, you will have to add enough area to the Blue square such that, when combined with the Red square, it equals the area of the Green square. To bring us back from the areas of the squares to the length of the legs of a right triangle all you need to note is that the area of any one of those squares is exactly one of its sides multiplied by itself or, said another way, one of its sides squared. 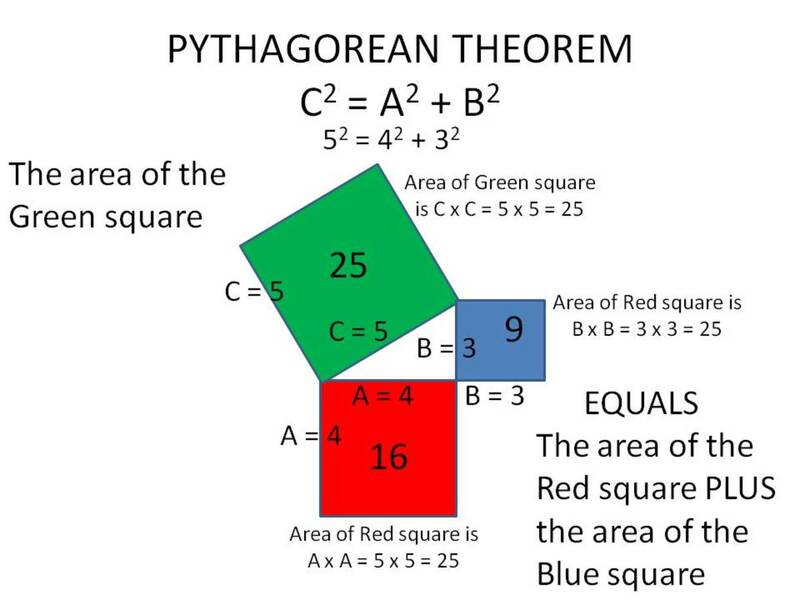 Pythagorean's Theorem, as we normally understand it, works in two dimensions; some paired combination of length, width, or height where any two of these dimensions correspond to the 'A' and 'B' legs of the right triangle. 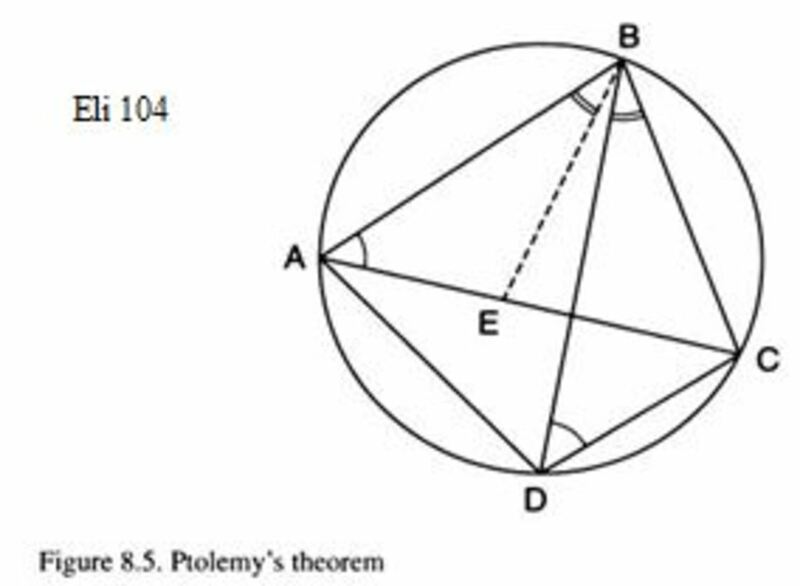 Without going into any proof, let me state the obvious, Pythagorean's Theorem also works in three dimensions, length (L), width (W), and height (H). There is nothing tricky about the new formula, it is simply adding one more term to the old formula. For reasons which will become apparent shortly, I am going to replace the 'A' and 'B' in the equation with either 'L', 'W'. or 'H' while leaving the hypotenuse the same, 'C'. So, assume first we are dealing with length and width, then we have C2 = L2 + W2 for our two-dimensional world. If we want to talk in terms of all three dimensions, we get, C2 = L2 + W2 + H2. As it turns out, this same expansion can be used regardless of the number of dimensions we want to talk about; all you do keep adding squared terms. For our purposes, however, we are only going to add one more which I will call 'T' so that my new "Pythagorean's Theorem" will read C2 = L2 + W2 + H2 + T2. Time is a dimension no different than length, width, and height; time is simply a fourth dimension and is the 'T' in our expanded Pythagorean Theorem. With the addition of 'T' dimension, some have started calling the resulting hypotenuse of our four-dimensional right triangle the "Einstein Hypotenuse EC." I will try to stay as far away from mathematics as possible so that there is at least a modicum of a chance I won't lose my non-math oriented readers but nevertheless some will be necessary. The first complicating factor we must introduce is that of units. So far in the charts I presented, I used simple numbers with no real representation of what they stood for. Most probably, you took them to mean distances of some sort, but I never really said until I changed the labels for 'A' and 'B' to 'L,' etc. Now, however, I do mean distances, and, since I am writing to a mostly American audience, although I must tip my hat to the many Canadians that follow me as well, I will use miles as my distance measure, although it really doesn't matter. For time, I will use the normal unit of seconds. This immediately presents a problem because, as you can see from Chart 3, we are mixing "miles" and "seconds"; mathematically, you can't do that. As a result, we need to start doing "math magic"; it is also, as it turns out, the first step in turning a "sow's ear into a silk purse." OK, what is the problem? We have "miles" squared equal to three times "miles" squared plus "seconds" squared; we got to do something about those seconds. 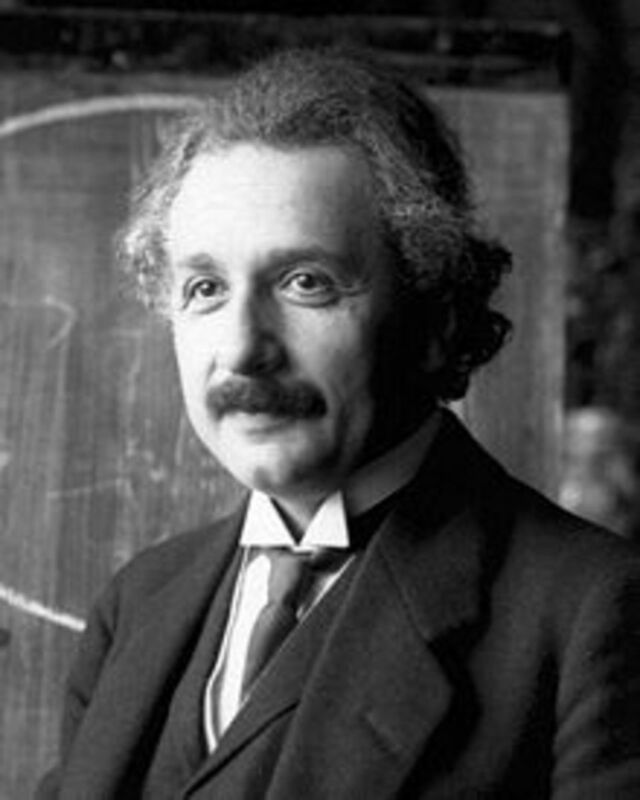 What we must find is a constant which relates distance with time and, guess what, we have one, provided by none other than Mr. Einstein ... light or rather the Speed of Light, 'c.' According to Einstein, the speed of light is a constant, some 186,282 miles/sec, so it does not fundamentally disturb anything by multiplying the Time dimension by this constant. 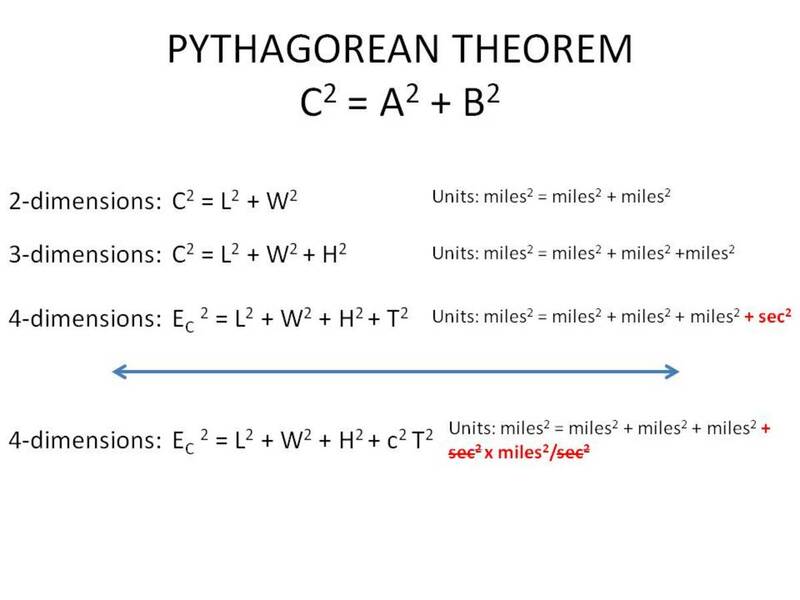 But, it does simply things for us a bit because the units of 'c' is miles/sec so, when c is multiplied by Time all you have left, in terms of units, is miles or, in our situation, miles squared. As a result, this "time" term is now in the same units as the rest of the equation and the equation is in balance. Therefore. referring to Chart 3, we have Einstein's Hypotenuse, EC2 = L2 + W2 + H2 + c2T2, where the units are in terms of length. Even the time dimension is in terms of length because we multiplied time by the speed of light, a constant. Mathematics allows you to multiply both sides of an equation by a constant without changing the nature of the equation. So, if we do that here and multiply each side by the speed of light squared, which has the same units as the existing terms, specifically (distance/time)2. 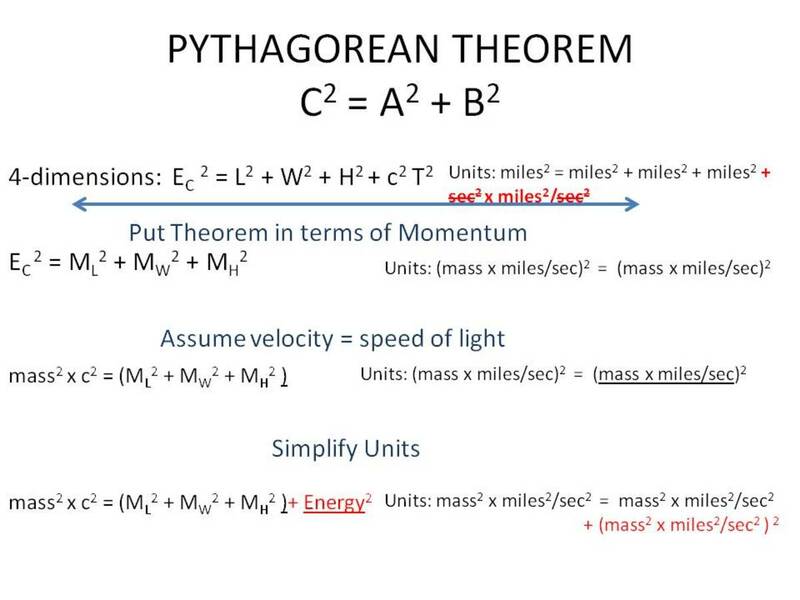 Consequently, as you can see in Chart 4 we can express the left-side of the Pythagorean Theorem as mass2 x c2 or m2c2. Let's add in, now, the 4th dimension of Energy, where the first three dimensions are momentum in the up-down, left-right, and back-forth directions. 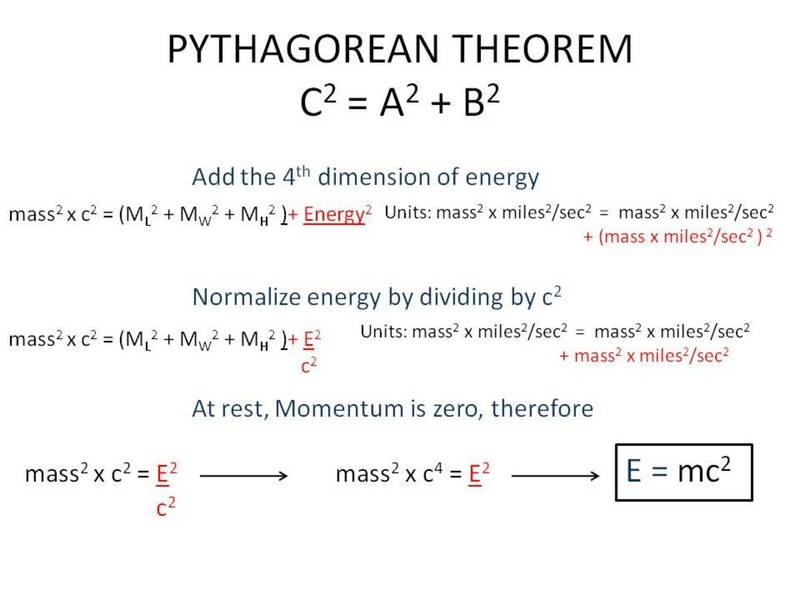 The problem with Energy is its terms, mass x distance2/time2. This must be corrected and can be done so by dividing by the speed of light 'c' which gives (mass x distance/time)/c. So, substituting back into E2, we get ((mass x distance/time)/c)2 or mass2 x (distance/time)2/c2.which looks exactly like the left-hand term we previously developed. Chart 5 shows this. One more assumption is now required, assuming that the system we are talking about is at rest then an interesting thing happens. Objects with zero velocity have zero momentum, therefore, all the Momentum terms in EInsteing's Hypotenuse equation become zero. E = mc2 Voila! Who needs the Calculus, algebra is just fine thank you. String Theory- The Theory of Everything? 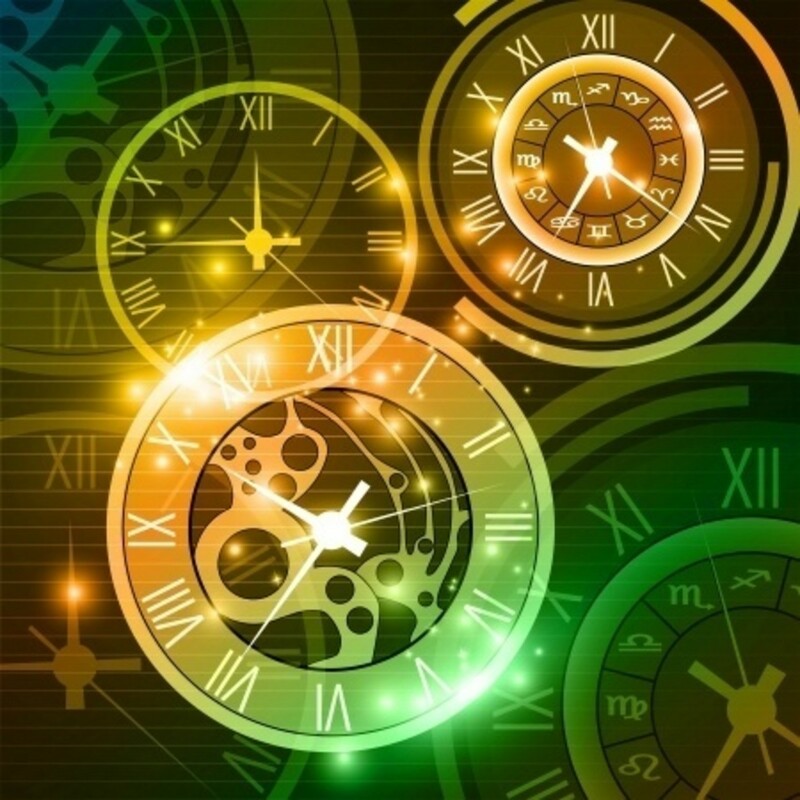 What Are Surprising Results From the Physics of Time? Thank you for taking the time to read my hub and for your very nice comments. Thank you for sharing. Recently I purchased a T-shirt with math humor. I didnt fully get the joke of Pathagreous and Einstein's stuggle for ownership of the C squared. So my curosity had me Google the pun and your article showed up. Nice and wasy to understand for a novice like me...and I think I understand the connection now but not laughing yet...thanks for your article. I am glad you enjoyed it and found it useful, Logan. Thank you for making this page it helped and inspired me to do more in theoretical physics then I thought I could do! Thank you for reading and commenting. I looked at the video, pretty cool. 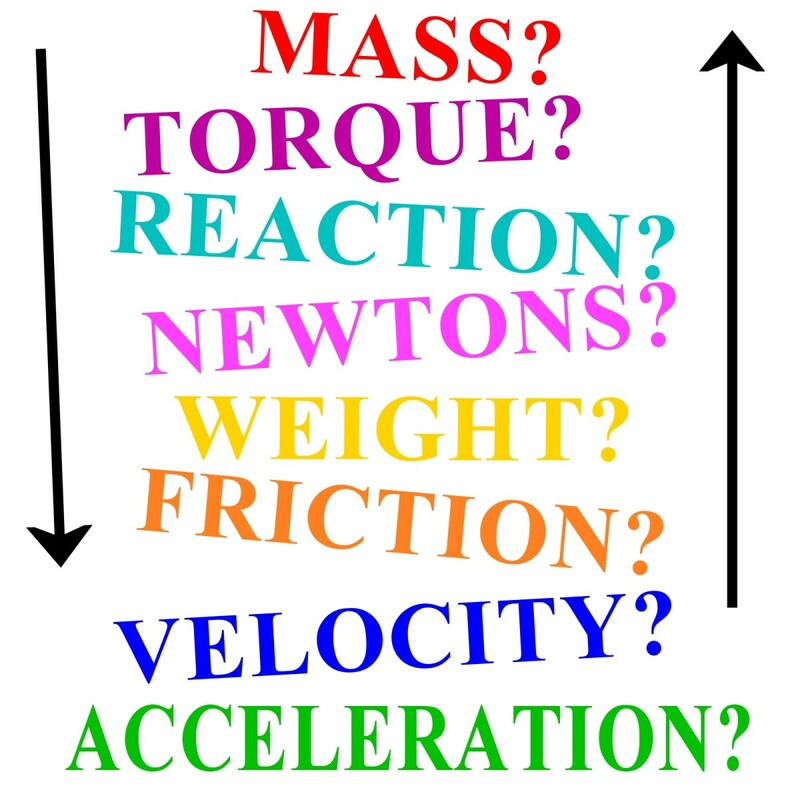 A simplified version of this can be seen in minute physics video e=mc2 is incomplete on YouTube. But I love how you went deeper here with the math. What do you mean by "form pieces of a possible future."? Btw, a math scientist, great or otherwise, I am not; just a BS with a stat option and only got a B at that. It is that just some of the stuff I was taught back in 1968 finaly started sinking in. What I am is a Meyers-Briggs INTP-type personality to the max, Google it, with a penchant for science, philosophy, and politics, with time on his hands at night. Element 115 is one of the hardest materials that has been made by man that has the ability to create enough power in a matter-anti-matter reactor. Although the only real quantity of this matter that the government has probably came from an astroid. As you probably know, when matter and anti-matter colide it creates pure energy. I was able to obtain information from Bob Lazar, his 5 year research helped me understand a lot. Talking with Wayne Mattson a few times throughout the years and great math scientists such as yourself, I have been able to form a theory. Hopefully, with a lot more studying and some luck, I will be able to prove that with deep low-frequency magnetic cranial stimulation in conjuction with knowledge of your e=mc2 explanation and perception of apparent motion, man can form pieces of a possible future. Thanks for you comment Tony, it has always been a fascinating subject. I am working on a hub regarding what I am learning about the so-called "God" particle, the Higgs boson as scientists would rather it be called. That is where you get down to the nitty-gritty, where matter supposedly results from the collapse of the weak nuclear energy forces; where E actually meets MC-squared. Mind-boggling! I am currently a softmore at the University of Phoenix, military division with a 3.79 GPA, 41 credits, studying Algebra II. 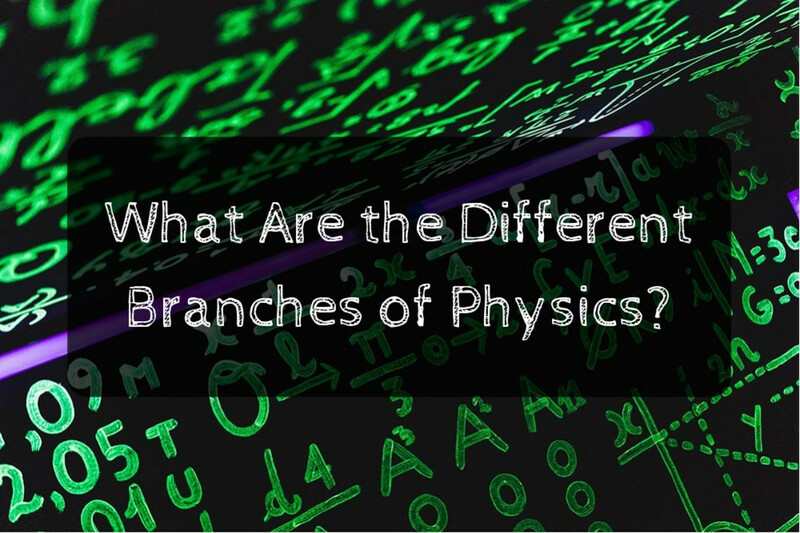 This explanation can be used to help explain perception of apparent motion in time and space. We might not be able to physically travel through time, but we might be able to see it or slow it down a little. Thank you for stopping by and leaving those kind words, professorcoban, I do appreciate them. As to tackling higher dimentions, that is probably beyond me now, if I was ever capable, in the first place. It took quite a lot of refresher to remember enough just to do this hub; it has been, what, 40+ years since I tried anything that esoteric. I just finished another hub where I had to relearn linear algebra/programming; that took about two weeks of research to finally come up with the equations needed to finish a discussion on production decisions based on Delta Airline's purchase of a refinery. This is an excellent explanation of Pythagorean theorem and process to the energy-mass equivalency formula. Don't forget the Pythagorean distance formula though. And also the E=MC2 is only true in a constrained set of unrealistic circumstances. Any object with a momentum will have much more total relativistic energy (the real equation is more complex, but it is simplified for momentumless particles). Other than that, the presentation was excellent. You wouldn't be interested in doing a similar presentation in some of the more interesting or higher dimensional geometries, would you? I just wanted to thank all of who have stopped by and are stopping by to read this rather ah... esoteric, hub. It now ranks seventh most viewed of all my hubs which says there are more people interested in science out there than I thought there were. Thanks for giving it a try Chris; I had forgotten that line from the "Oz". With a few more sentences, he might have gotten out the Special Theory of Relativity, lol. You are welcome Lily, thanks for reading and commenting. All that matters is if one has the desire to keep learning. This is not only beautiful, it is beyond my paltry understanding. All I know is Pythagoras received his epiphany, standing in a ditch a few thousand years ago, and that the Anazazi had the string theory latched down about the same time.